April 19, 2014 By Allyson 2 Comments This post may contain affiliate links. Read my disclosure policy. We probably eat pasta once a week or at least a couple times a month. It’s quick and easy and time is one thing we are always running short on. I love making garlic bread to go with pasta, and it wasn’t until recently that I thought to add some seasoning to it. Why wasn’t I doing this before?!? 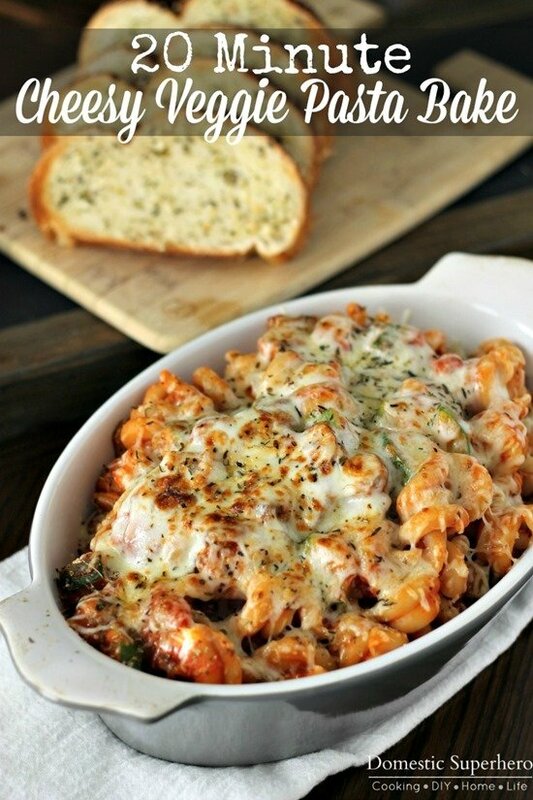 It seriously adds so much to the bread, and it makes it soooo yummy! It only takes a few minutes and it’s well worth it. So far I have only used dry spices to make it, but I think once my herb plants start growing in the next few weeks, I will try using fresh herbs. I can’t wait! Slice up your fresh bread and lay it out on a baking sheet. Semi-melt your butter, and then add 3-4 tsp minced garlic, some oregano, thyme, basil leaves, salt and pepper to the butter. Then mash that together with a fork. Using a brush or knife, smear the butter mixture over the each slice. Then cook a few minutes under the broiler. Super easy! 1. Preheat broiler to high. 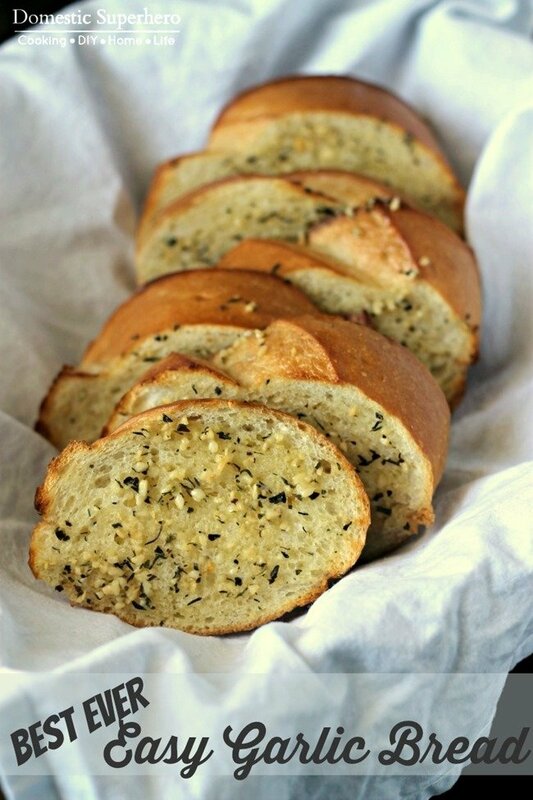 Slice bread into slices and arrange on a lined baking sheet. 2. Cut butter into 1 TBS wedges and put into a microwave safe bowl. Microwave at increments of 15 seconds, for about 45 seconds. You want the butter extra soft, but not melted (it's okay if some melts a little but think pudding consistency). Add the garlic and seasonings to bowl with butter and use a fork to mash/mix well. 3. 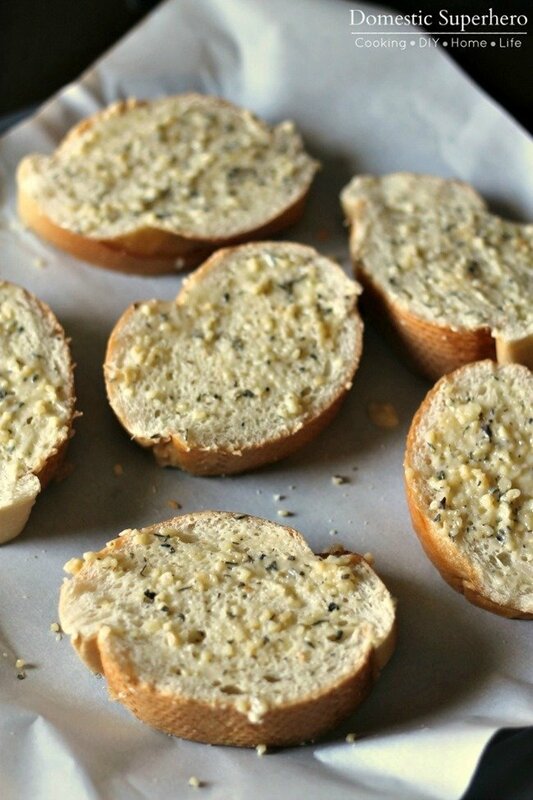 Using a pastry brush or a knife, spread a generous amount of herb butter onto the top of each slice of bread. Don't be stingy with the butter! 4. Place in broiler and cook until lightly browned on the edges, about 3-4 minutes. Watch closely as it can burn very quickly under the broiler. 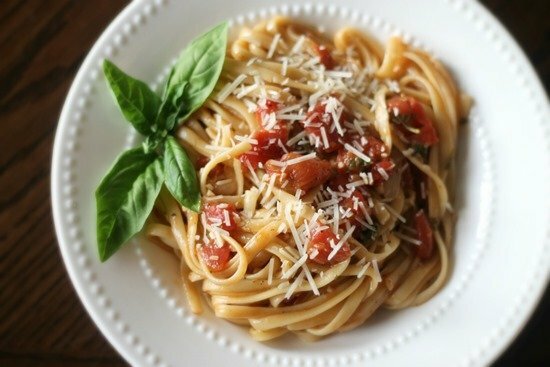 **You can definitely try using fresh herbs in this recipe. You can also add more herbs if you'd like. I don't typically measure them out and just sprinkle a bunch into my bowl. 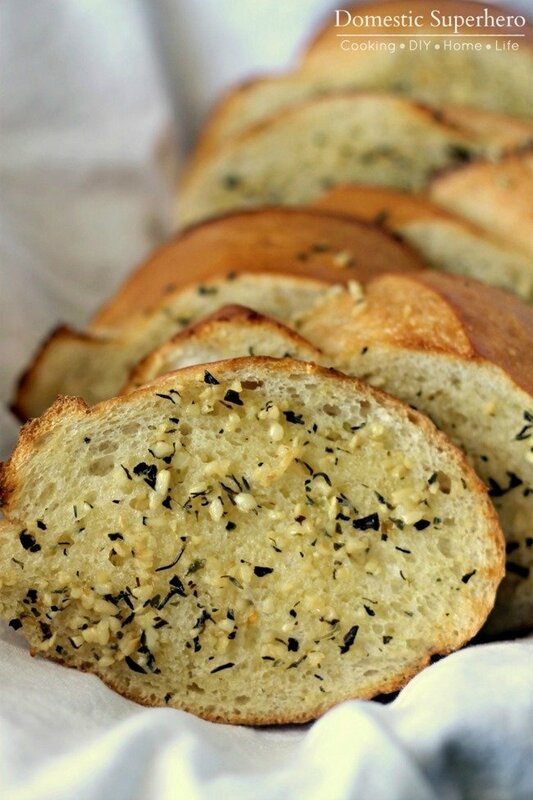 Love garlic bread! 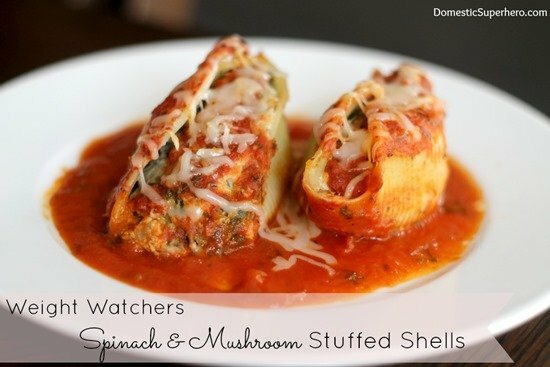 I butter it and sprinkle on Italian seasoning, garlic powder and Parmesan cheese, then broil…yum! !